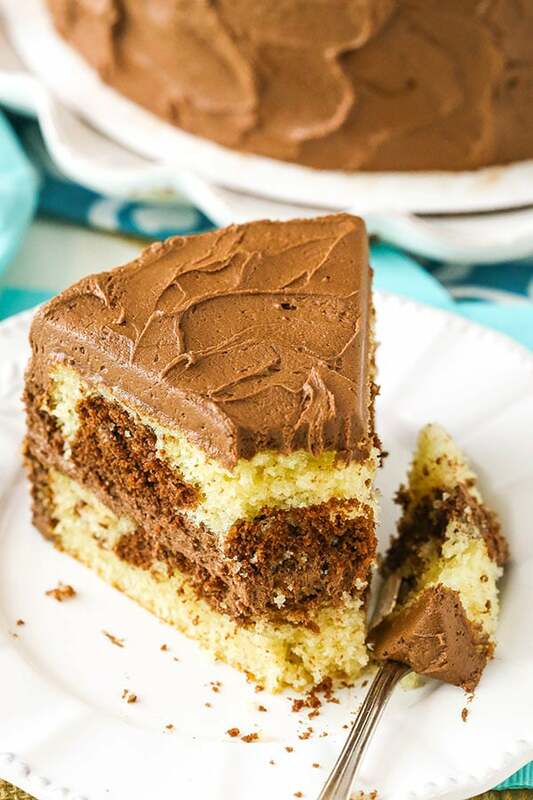 This Marble Cake is wonderfully moist and made with swirls of vanilla and chocolate cake! 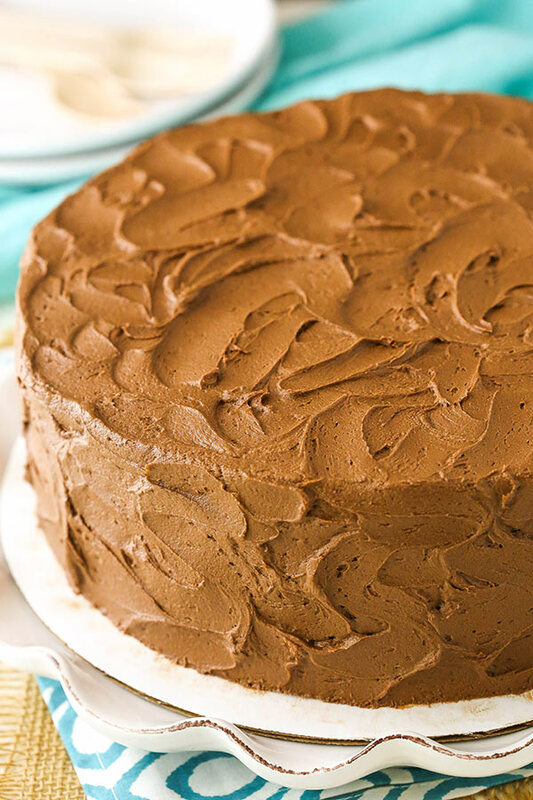 It’s covered in chocolate frosting and a classic cake for any occasion! After many, many versions of this Marble Cake, I’m so excited to share the final one with you. 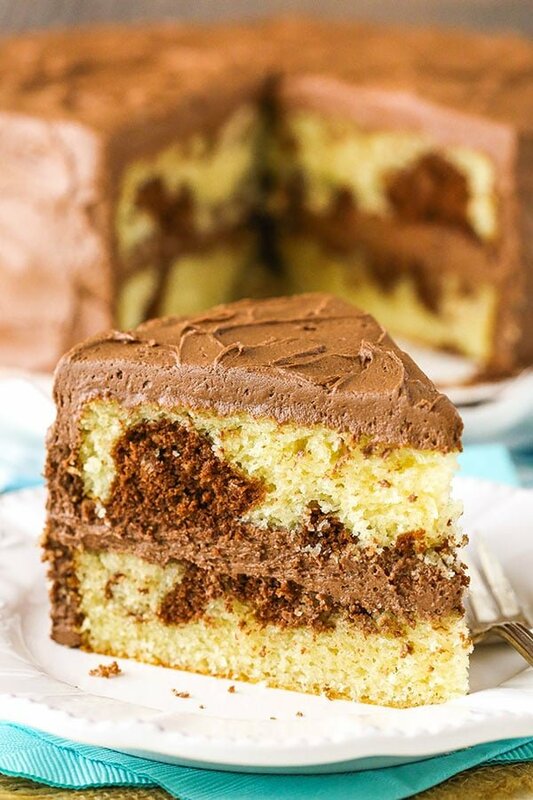 I’ve gotten lots of requests for a Marble Cake lately, so I knew I needed to share this recipe as soon as I had it right. I even went to my Instagram Stories to ask what makes a good Marble Cake, so that I could be sure to incorporate everything. I have to say this cake is all that we want it to be – moist, has distinctly chocolate and vanilla flavored cake and well balanced between the two flavors. Plus, both the chocolate and vanilla cake batters come from the same batter, making it quick and easy to put together. Love it! 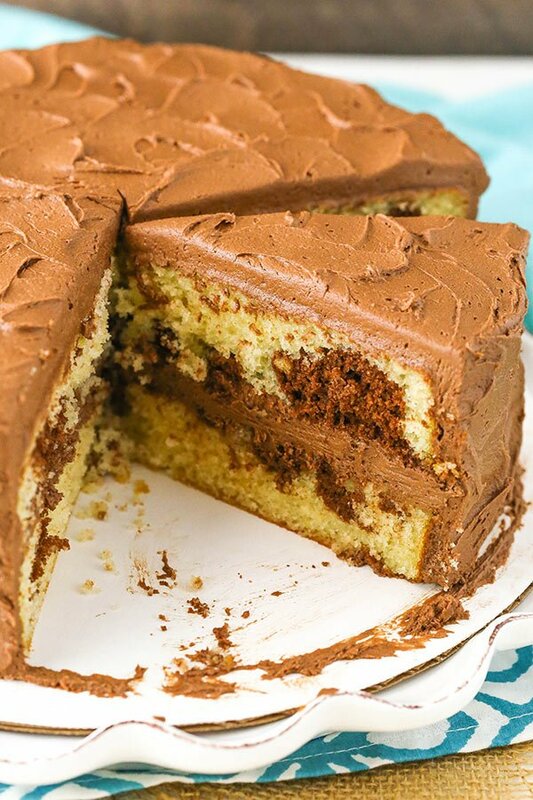 So to get started making this Marble Cake, you’ll make the vanilla cake batter. A combination of butter and vegetable oil are used to add both flavor and moisture to the cake. Butter adds the flavor you really love in a vanilla cake, while oil adds the ever important moisture. The butter, oil and sugar are all creamed together until nice and fluffy, then the eggs are added. I love that this batter uses whole eggs, so there aren’t any egg yolks or whites left over that you’re either throwing away or trying to find a use for. Next up is the vanilla extract and buttermilk, which are added in between the two additions of the dry ingredients. I love the extra flavor and tenderness that the buttermilk adds, but it could be replaced with regular milk, if you prefer. Once the batter is all combined, 1 1/4 cups of batter should be separated and the melted chocolate added. I played around the most with this particular step. How much of the batter should be used for the chocolate, what kind of chocolate to use and how much chocolate? All such important questions! The kind of chocolate was the first thing I played with. The chocolate you use actually makes a significant different in the final texture and taste of the chocolate cake. I knew I wanted to use melted chocolate, so I initially started out using pure 100% chocolate. It ended up not being my favorite option because it made the chocolate cake noticeably different in texture from the vanilla and was more dense and dry. Not to mention that it was a little more bitter tasting. I then tried semi-sweet chocolate, which is a favorite of mine in baking. While it improved the texture of the cake, I found the chocolate flavor to not really be enough. It was fine, but just a bit lost. Next up was a bittersweet chocolate, which is kind of a middle point between the 100% cocoa and semi-sweet, since it’s a 60% cocoa. The bittersweet chocolate was perfect! Great chocolate flavor, but not overpowering or bitter. I also messed around with the amount of melted chocolate used and decided that a little less melted chocolate went a long way. It added plenty of flavor and did a better job of maintaining the same cake texture between the chocolate and vanilla batters. Too much added chocolate still messed with the texture more than I wanted it to. The final decision was how much cake batter to actually add the melted chocolate too. I have to say this was the hardest thing to decide on. I ended up with 1 1/4 cups of batter being used for the chocolate part of the cake. One cup would work and 1 1/2 cups would work, but I felt as though 1 1/4 cups was just right. That said, you could totally adjust that to your preference without having to adjust anything else about the recipe. It’s flexible like that. As for marbling the cake when you add the cake batters to the pans – you don’t want to overdo it. I really liked having them a little more separate so that you got the distinctly chocolate and vanilla flavors. 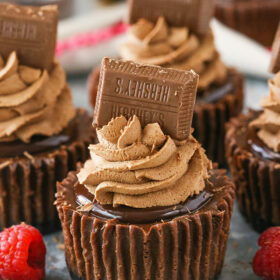 Too much marbling and the chocolate can kind of take over, so keep that in mind. I ran a knife in a swirl through the cake in one direction once, then the opposite direction once and that was it. The final cake is covered in a delicious chocolate buttercream frosting! It finished it off perfectly! However, you could totally use a vanilla frosting as well. 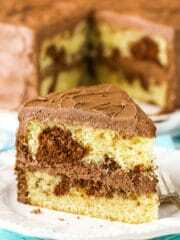 The great thing about Marble Cake is that there are many ways to go about it and this recipe is pretty flexible. The cake is moist, flavorful and easy to put together too, which are all winners in my book. I hope you enjoy it! 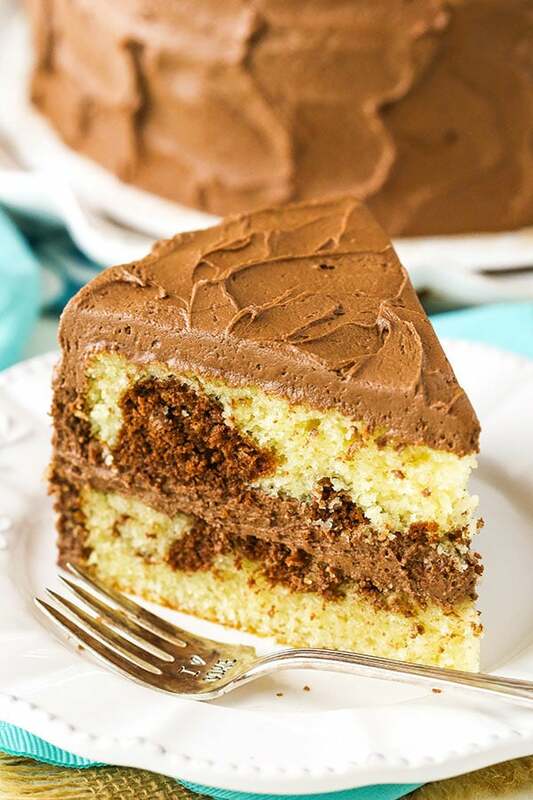 This Marble Cake is wonderfully moist and made with a swirl of vanilla and chocolate cake! It’s covered in chocolate frosting for a classic cake! 1. Prepare two 9 inch cake pans with parchment paper circles in the bottom and grease the sides. Preheat oven to 350°F (176°C). 3. Add the butter, vegetable oil and sugar to a large mixer bowl and beat together until light in color and fluffy, about 3-4 minutes. Do not skimp on the creaming time. 4. Add the eggs two at a time, mixing until well combined after each. Scrape down the sides of the bowl as needed to be sure all ingredients are well incorporated. 5. Add half of the dry ingredients to the batter and mix until combined. 6. Add the milk and vanilla extract and mix until well combined. 8. Set aside 1 1/4 cups of batter, then divided the remaining batter between the two cake pans and set them aside. 9. Melt the chopped chocolate, then add it to the batter that was set aside and gently fold together to combine. 10. Drop spoonfuls of batter over the top of the vanilla batter that is already in the cake pans. Use a knife to swirl the chocolate and vanilla batters together, being careful not to over combine them. I ran a knife in a swirl through the cake in one direction once, then the opposite direction once and that was it. 11. Bake for 18-22 minutes, or until a toothpick inserted comes out clean. 12. Remove the cakes from the oven and allow to cool for about 2-3 minutes, then remove to cooling racks to cool completely. 13. To make the frosting, beat the butter and shortening together until smooth. 14. Add half of the powdered sugar and mix until smooth. 15. Add the vanilla extract, cocoa powder and 4-5 tablespoons of water or milk and mix until smooth. 16. Slowly add the remaining powdered sugar and mix until smooth. Add additional water or milk, as needed to get the right consistency of frosting. 17. To put the cake together, use a large serrated knife to remove the domes from the top of the cakes so that they’re flat. These cakes don’t have a large dome, but I like to make sure they’re completely flat. 18.Place the first cake on a serving plate or a cardboard cake round. 19. Spread about 1 cup of frosting evenly on top of the cake. 20. Add the second layer of cake on top , then frost the outside of the cake. Store in an air-tight container. Cake is best when eaten within 3-4 days. *I use powdered buttermilk. Regular milk would work fine as a substitute. **I strongly recommend sticking with bittersweet chocolate for this cake. I find it gives the best flavor and texture to the chocolate cake portion. NOTE: If you’ve like to use a vanilla frosting on this cake, replace the cocoa powder with an equal amount of additional powdered sugar and increase the vanilla extract to 3 teaspoons (1 tablespoon). 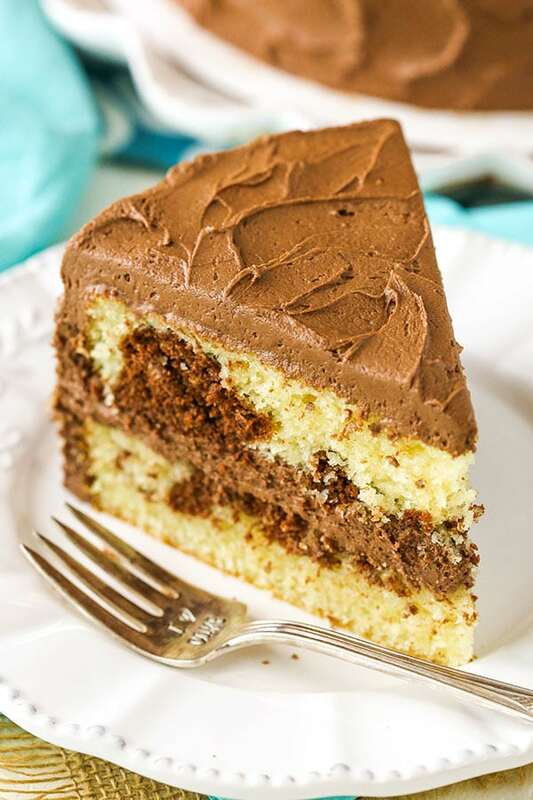 Hi Lindsay, LOVE your recipes and would like to try this marble cake. How would I adjust the ingredients so they go into a bundt pan? Thanks in advance. I’m so glad you enjoy the recipes! I’m really not sure about a bundt pan, since I haven’t tested it. It could end up being quite dense. That’s so crazy – I literally made my own marble cakes this weekend! Yours looks so tasty and moist. Love it! I had marble cake for my wedding cake. I love it! Yours looks so yummy and just kind of old fashioned and pretty! Thanks Joanna! I hope you’re able to give it a try! I love to bake all kinds of desserts! Looking forward to seeing what comes next! I have updated the recipe to make that more clear. Thank you! I have tried many marble cake recipes and not been totally happy with the results. I am looking forward to making your marble cake recipe as it seems to tick all the boxes, which every other recipe seems to miss. Just a question about the weight of the butter. I am from Australia and thought that half a cup of butter was 112 grams. Could you please clarify this for me. First time commenting, and it will be the first recipe I make of yours. Rather exciting. You are correct, I’m sorry about that! I’ve updated the recipe. Thank you! hi i made this cake this morning but it didnt turn into a chiffon. it was not light and soft. it was densed. then thr batter with melted chocolate you mean you will not use all of it? just spoonfuls? what about the rest? then the frosting i only used 4 cups powdered sugar instead of 8 cups and the color didnt turn into the color of your cake. maybe it varies from the cocoa powder that was used. another question is that when you say one cup buttermilk, is that pertaining to liquid form already. then how much of the powdered buttermilk should i prepare before dissolving it with water? The spoonfuls are dropped over the vanilla cake batter, but you do use it all. For the frosting, more powdered sugar will lighten the color of the frosting. Different cocoas could also make a difference. The one cup of buttermilk is simply one cup – that’s it. I use powdered buttermilk, but you could use the liquid one. If you’re using the powdered, follow the instructions on the container of the one you use. up into small chunks. Very surprising, since the chocolate was warm and the oven was hot. Any theories? It was still a wonderful tasting cake and was gone in two days. Hmmm, so the chocolate didn’t have chunks before it was baked, but it did afterwards? What kind of chocolate did you use? Was it chocolate chips? I used the 60 percent cocoa chips by Ghirardelli and melted them. It was smooth and warm when I added it to the batter .Must be the chips because you used a bar of chocolate and chopped it. I will try making this cake again and see what happens. Yea, I had wanted to try the chocolate chips to see if they worked well. I’m guessing that was the issue. I’m sorry! I would like to do a marble cake with an other of your vanilla cake/cupcake recipe (your Favorite Moist Vanilla Cupcakes). It’s the base I use for all my cakes and cupcakes. Do you think if I put melted chocolate the texture would be alright? I kind of hope it will make a good chocolate cake so that I only have one base recipe. Thank you for all the time you put making wonderful recipes and to share them with us. I haven’t tried it with that cake to be able to say for sure, I’m sorry. It’d definitely be worth trying though! Haven’t even made the recipe yet, but I already love this recipe! 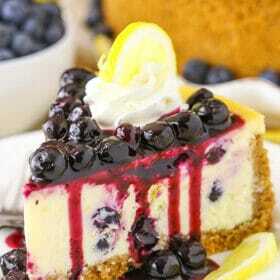 Can’t wait to have a slice of this with a cup of coffee: YUM! This looks great. Could this be done as a sheet cake? I haven’t tried this as a sheet cake, but I used a similar recipe for this vanilla sheet cake so I’m guessing it’d be fine. Hello Lindsay I love cakes I always do ur recipes it works perfectly amazing honestly. I have question what can I put instead of shortening it’s not available place that I live I try margarin n didn’t work out good taste wasn’t good at all specially for buttercream what would be your recommend? I would use butter, feel free to refer to my Vanilla Buttercream Icing recipe. Additional butter can be used in place of the shortening. I have question what I can use instead of shortening cuz it’s not available place that I live? And thanks a lot for responding back quick ???????????????? I’m glad the baking videos are helpful! Instead of shortening you can use butter. Here is a link to my Vanilla Buttercream recipe using butter instead of shortening. My son and I made this as written for his birthday – it is delicious! Frosting makes A TON – I think if I’d have halved the frosting recipe it would have been enough. Would the measurements change if this was converted into a quarter of a sheet cake (9×13)?If so, by how much? Your recipes are always the best, but I would like to try this as a sheet cake. The taste of the vegetable oil does not cook out whilst baking, and leaves an unpleasant taste in the mouth which remains even after eating. The smell also lingers, similar to something that has been deep fried. Maybe it is an American thing, as I don’t really see oil included in any British/Australian cake recipes. It is a nice recipe apart from this, maybe some people have different tastes. Could cocoa powder be substituted for the cake? If so what would you recommend? No, it actually doesn’t work well. Thanks. I made the cake and it was delish. I did use chocolate but found the chocolate cake was more dense. Hello Lindsey, I am excited to try this cake! I am going to today. Thx! Great recipe….turns out yum everyone !! I generally make 2- 7inch pans.just want to know can I half the ingredients and make a simple pan….wud it work?? I haven’t made a cake that size, so I’m not sure. Glad you enjoyed it! I don’t see the actual recipe anywhere. Very frustrating!! !